Coolest Thing I Saw Today! And it Hides a Secret! I go to estate sales all over Kansas City these days. It’s a good day when one is happening in my very own town. Today was such a day. I was one of 30 people in line when the doors to this shoemaker’s estate sale opened up at 9:00 this morning and I’m so glad I was. I had my eye on something in particular – this 1920’s cast bookend, which I was lucky enough to grab up. And I also put my hands on this beautiful walking stick, and didn’t let go (estate sale-goers are crazy!). All I knew about it was that it was old and gorgeous. It wasn’t until I got home and was playing with it that I realized that it had a secret hidden inside: it is also a knife. A little research and I was able to determine that the item is probably from the late 19th century and made in India. It features carved bone and hand carvings in the wood, which has been ebonized. And I love it. As much as I think I would love to be a little old lady who walks with a cane that has a hidden 22″ blade in it in a few years, I have decided that I am not ready for a cane just yet. So on eBay it goes. Isn’t it fantastic?! My husband and I have lived a few places together. We have lived in larger homes with lots of space, and we’ve lived in hotel rooms. Right now, we’re somewhere in the middle. We have a little slice of heaven in Liberty, Missouri with a nice fenced-in yard for our three dogs and our home is just under 1,000 square feet. Compared to the hotel rooms it’s palatial, but our furniture was bought several years ago for a much larger home with much larger rooms, so we’re trying to adjust. 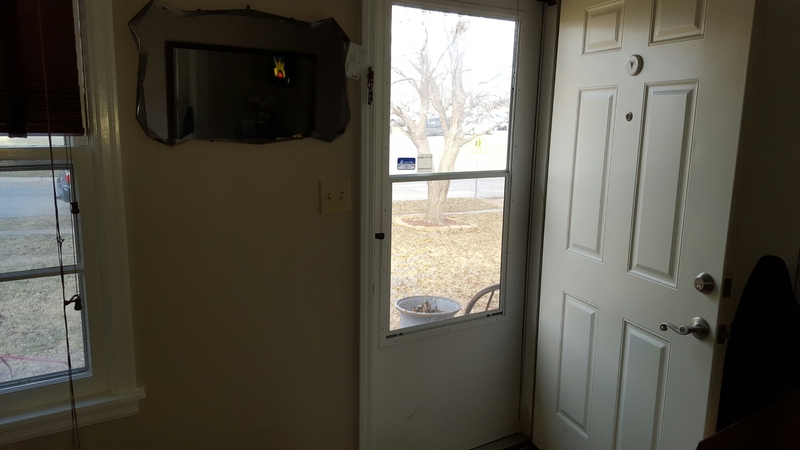 Which brings up the point of our entry way. It is small and leads into a room that we are struggling to make do with our current furniture until we feel like the timing’s right (first in line: 2015 tax bill, new washing machine, etc. ), which means we really don’t want ONE MORE piece of furniture in the living room. But where to put our keys when we walk in the door? I came up with what I think is the perfect solution, after having cruised ebay and other sites for “floating shelves”. New shelves cost hundreds of dollars and old ones, well, they were too ornate for our 1963 home. So I found this drawer at an antique mall in Fort Leavenworth, Kansas. It was more than I would ordinarily spend ($24- *GASP! *) but the size and color were spot on as-is. Initially, I thought I would just have the hubby put it up as is, with the patina and the weathered look, but Mr. Wonderful was pretty adamant that it wouldn’t work, considering the living room has a brand-spanking-new coat of paint on the walls AND the trim, which is now stark white. It’s a crisp look and he felt like a rubbed-out old catalog drawer would clash, and I’m sure he was right. 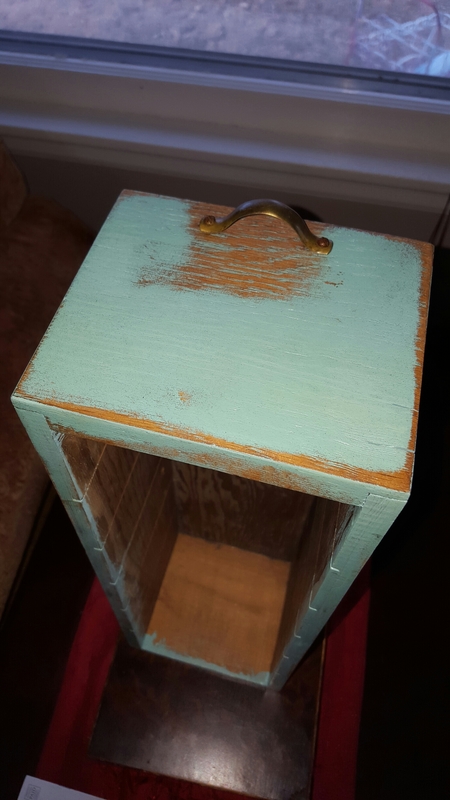 But we both liked the turquoise color, so we agreed I would paint it the same color, just without the wood rubbed through and with the inside of the drawer painted too. But, I insisted, the drawer pull stays. So I painted it. I would have been cool having it attached to the wall by its side, so that it still acts like a drawer, but hubby and I negotiated again and decided it would be attached to the wall by it’s bottom. The only problem is then that the bolts he attached them with would be visible, so I had some thinking to do. The solution came one afternoon when I was looking over some old retro napkins I had bought some months earlier. I decided that their designs would be FABULOUS with the color of the shelf, so I cut out two pieces of cardboard that exactly fits in the bottom of the drawer and I covered them. One was covered in one of the napkins, the other with a piece of embossed white wallpaper I had just picked up for $1 at an estate sale. Then I inserted them into the shelf to see which one worked best. The white option showed best with the stark white trim around it, so that’s what I picked! I hope you like it; we sure do! In progress! 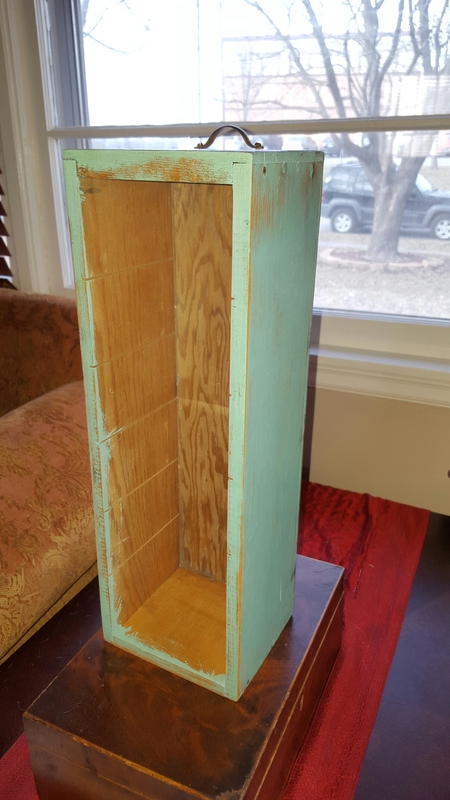 Which insert to use and what to decorate it with – all small items considered! Putting the shelf up meant big bolts, because we may decide to hang hooks off of it for my purse, which is like a bag of bricks. So the challenge was to hide them. Voila!